(March 2008) Its „Cheers“ that one might shout out loud even as, in this case, we’re talking about a cemetary. But as a matter of fact, the work, which was awarded for being the „Most Unusual Memorial in Great Britain“, reminds of a hard drinking contemporary. The stone was shaped for someone who, according to the inscription, was „the entertainer“ and who „could light up any room“ with „his hormonica and tunes“. The fact that he was not at all reluctant to drinking, is proved by the design of the memorial: It has the shape of a pint, which is the typical glass for the British beer and which corresponds to a little more than half a litre. The competition for the „Most Unusual Memorial“ is anually awarded by the Memorial Awareness Boad (MAB). In 2007 it was given to Henry Wilson Memorial Masons in Uxbridge in Middlesex. 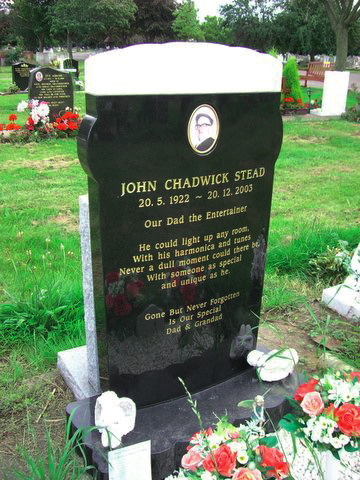 Nota bene: The memorial for John Chadwick Stead, who is now buried underneath the awarded work, can be found on a public cemetary, and the MAB is a highly sincere organ of the branch. The design was developed and realized by stone-mason Patrick Aivazian, who showed himself in an email to BusinessStone.com „a little surprised, but anyway thankful“ for the attention that this work has brought him. For the corpus of the glass with the imaginary beer, he used black granite, for the spume white granite. Both stones originate from China. The surface is polished and a little convex in order to strengthen the impression of a glass of beer. The background of this unusual award is „to make the public aware that they don’t have to limit themselves to a standard memorial“, as the National Association of Memorial Masons (MAMM) writes on its webpage. The Memorial Awareness Board is one of its initiatives.